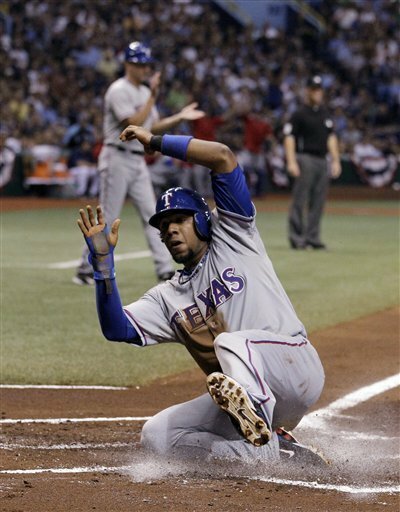 It looked like A. J. Burnett and the New York Yankees had turned the corner against the pesky Texas Rangers. Well that was until they saw what they thought might be victory disappear in a barrage of Rangers runs leaving Yankee Stadium nearly devoid of Yankees faithful for the second night running. The feeling among Yankees fans is symbolized by the reaction of their fans, they know that they are done and baring an improbable comeback the Yankees will not repeat as either American League or World Series champs. The Yankees got out to an early 1-0 lead on a home run by Robinson Cano that on review should have been ruled as fan interference but was allowed without video review by the umpiring crew. Lance Berkman came up next and hammered a shot down the right field line that was initially ruled as a home run but was reviewed and disallowed passing narrowly to the right of the right field foul pole. The Rangers wasted no time getting those runs back as in the top of the 3rd inning Burnett seemed to lose his edge. David Murphy walked and took second on a wild pitch. Burnett then nailed Benji Molina in the back as Molina was attempting t bunt. Mitch Moreland then hit a sacrifice fly ball to send Murphy to third base and Molina to second. Elvis Andrus grounded out to score Murphy and was followed by Michael Young who singled to plate Molina to give the Rangers a 2-1 lead. Rangers’ starter Tim Hunter struggled giving up another run in the bottom of the third inning when Derek Jeter tripled and scored on Curtis Granderson’s single. Burnett held the Rangers in the top of the 4th inning and the Yankees made things very interesting in the bottom half of the inning. 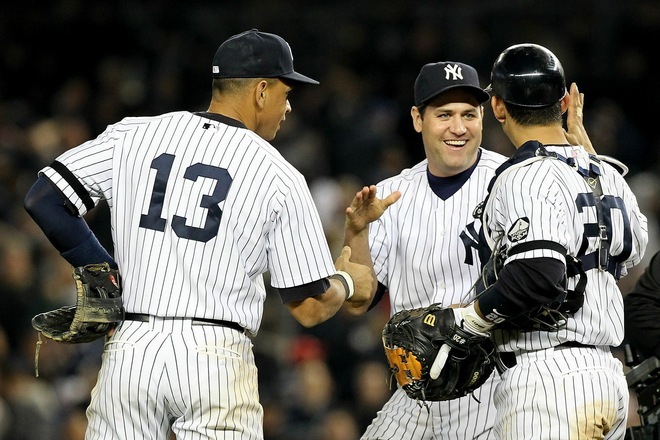 Hunter hit Alex Rodriguez with a pitch to lead off the inning and Robinson Cano singled and advanced him to 2nd base. 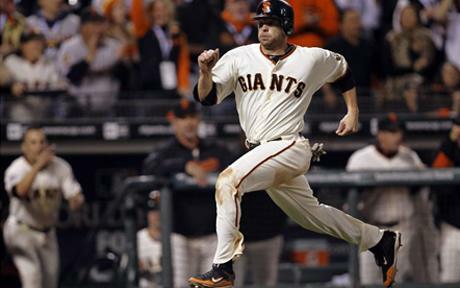 Hunter the struck out Nick Swisher for the first out and Lance Berkman singled to load the bases. The Rangers’ brought in Derek Holland to attempt to stop the bleeding. Holland got Brett Gardner on fielder’s choice which scored Rodriguez to give the Yankees a 3-2 lead. Holland then took command striking out Francisco Cervelli to end the inning. 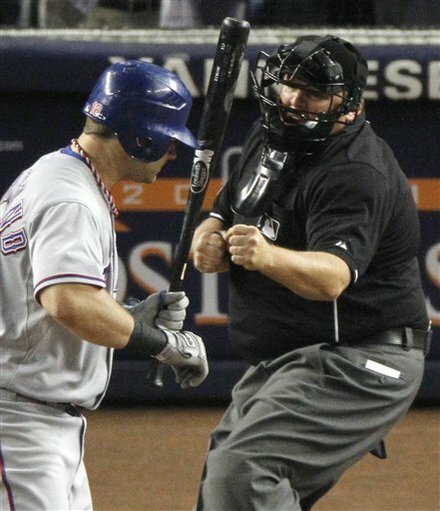 The Rangers loaded the bases in the top of the 5th inning but did not score and Holland despite giving up a leadoff double to Jeter shut down the Yankees in the bottom half of the inning. In the 6th the wheels came off of the Yankee Express. Vladimir Guerrero singled to lead off the inning and Burnett got the following two batters out before intentionally walking David Murphy with Guerrero on second. 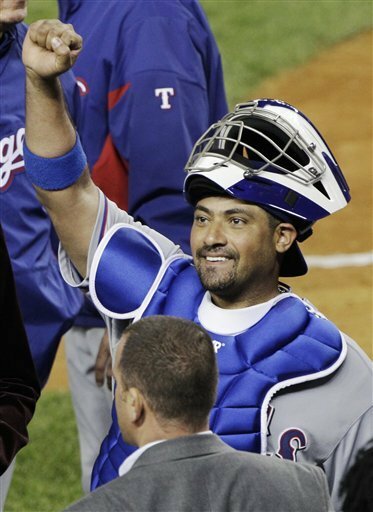 The brought Benji Molina to the plate and the Rangers’ catcher seized the moment pounding a 3 run home run into the left field seats. Burnett got Mitch Moreland to foul out but the damage was done, the energy that had been gathering in Yankee Stadium was gone. In the 7th inning the Yankees’ relievers were handed the task of trying to shut down the Texas assault on Gotham. David Robertson after a horrific night on Monday got the first two batters out and was relieved by Boone Logan who promptly surrendered a solo home run to Josh Hamilton to bring Joba Chamberlian into the game. Joba fared no better giving up a double to Vladimir Guerrero and walking Nelson Cruz before giving up a RBI single to Ian Kinsler before striking out David Murphy to end the inning with the Rangers ahead of the lifeless Yankees by a score of 7-3. Holland set down the Yankees in order in the bottom of the 7th inning. In the 8th Chamberlain allowed a single to Benji Molina but got out of the inning without giving up another run. In the bottom of the the Yankees threatened again loading the bases on a series of walks by Holland, Darren O’Day and Clay Rapada before bringing in 40 year old veteran Darren Oliver who closed out the inning without giving up a run. 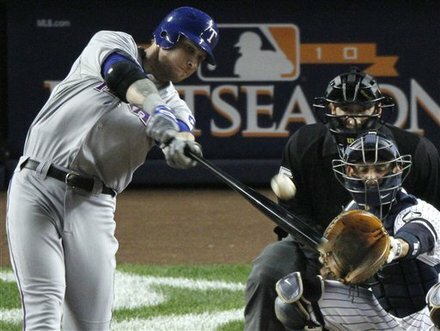 The Yankees woes continued in the top of the 9th as the Rangers put the noose around the Yankees in game four. Sergio Mitre relieved Chamberlain and gave up a leadoff home run to none other than Josh Hamilton, his 4th homer against the Yankees in 4 games. Guerrero singled and was lifted for pinch runner Julio Borbon but Borbon’s speed would not be needed as Nelson Cruz took Mitre yard for another Rangers home run. 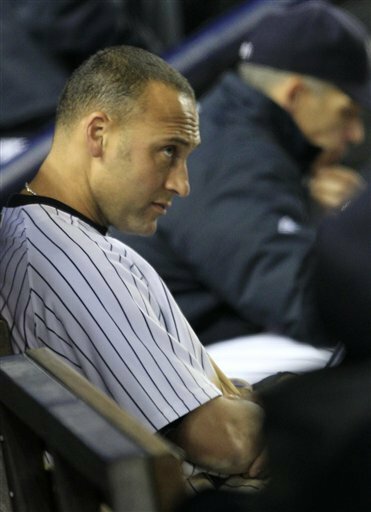 The Yankees got a leadoff single from Brett Gardner in the top of the 9th but Jorge Posada, Derek Jeter and Curtis Granderson went down in order leaving the Bronx in a state of shock for the 2nd straight night. The Rangers scored 10 runs on 13 hits making their total 31 runs for the series on 43 hits agains an anemic 11 runs on 26 hits for the Yankees. To make matters worse for the Yankees the team lost Mark Teixeira to a season ending hamstring pull while trying to leg out a ground ball. 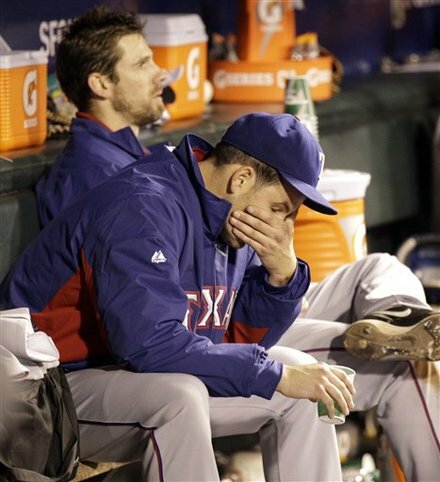 Derek Holland got the win and the 82 million dollar bust, A. J. Burnett took the loss. The Rangers now lead the Yankees 3 games to 1 and have to have C. C. Sabathia make the performance of his life to stay alive this afternoon. That will be a tall task as the big right-hander has not done well this post-season. The Texas Rangers did what they should have done on Friday night and defeated the New York Yankees 7-2 at Rangers Field in Arlington Texas. The win was their first win in a playoff series at home in franchise history. The win was an impressive win for the Rangers who were coming off a very disheartening loss on Friday night where the bullpen melted down in the 8th inning to had the Yankees a 6-5 win. Saturday was different the Rangers got out to an early lead and held on holding the Yankees to just 2 runs while ringing up Phil Hughes for 7 runs on 7 hits in four innings work. 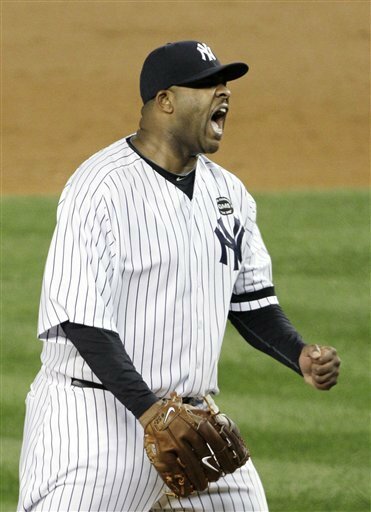 Hughes didn’t look at all like he looked when he shut down the Rays in game three of the ALDS. Elvis Andrus singled to lead off the first inning, advanced to second on a wild pitch, stole third and then stole home for the first run. The aggressive base running seemed to set the Yankees back on their heels just as it did the Rays in the ALDS. In the second inning the Rangers stuck again when David Murphy homered and was followed by Mitch Moreland and Elvis Andrus who both singled. 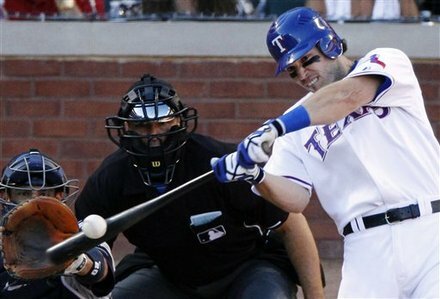 Moreland scored when Michael Young doubled to give the Rangers a 3-0 lead. 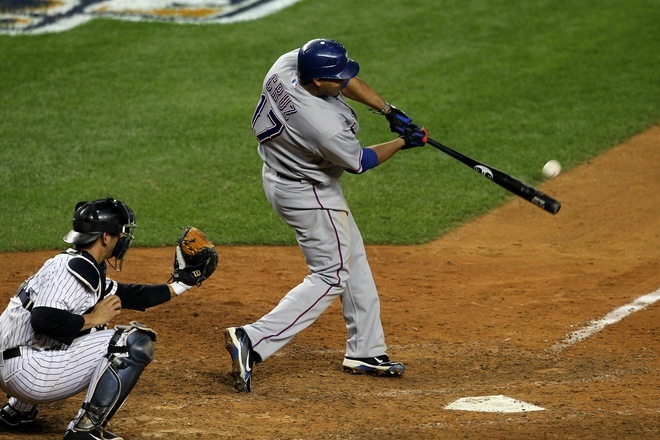 The Rangers scored two more runs in the 3rd inning when Nelson Cruz doubled and scored when Murphy doubled. Murphy then scored on a Benji Molina double to make the score 5-0 after three innings. The Yankees got one run back in the top of the 4th inning. Robinson Cano doubled to lead off the inning and took third on a wild pitch. He then scored on a two out single by Lance Berkman who then was caught going too far off of first and was tagged out to end the inning. The Rangers continued their assault on Hughes in the bottom of the 5th inning when Nelson Cruz doubled and scored when Ian Kinsler tripled. Kinsler scored when Mitch Moreland singled to give the Rangers a 7-1 lead. In the top of the 6th Lewis got in some trouble with Robinson Cano hitting a solo home run and then gave up a single to Jorge Posada and a walk to Berkman before he left with two outs being relieved by Clay Rapada who struck out pinch hitter Marcus Thames. That would be all of the scoring although the Yankees threatened in the 7th 8th and 9th innings as the Rangers’ relievers shut down the potent Yankee lineup with Neftali Felix coming in to close out the Yankees. Tonight the Rangers relievers did not blow the game and the series now goes into New York knotted at one with Cliff Lee scheduled to start game three in Yankee Stadium and Andy Pettitte. It should be an interesting go from here on out.